Quentin Golden Bear Hotel i Amsterdam, Nederländerna : Boka nu! The Golden Bear Hotel is housed in two 18th century buildings on one of the best shopping areas with an abundance of boutiques known as the '9 straatjes', which consists of nine streets that are situated between the canals Prinsengracht and Singel. 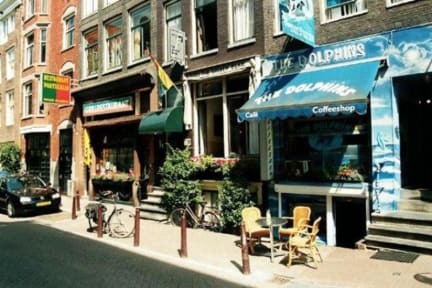 The entertainment square, 'Leidseplein', is located around the corner and is surrounded by several entertainment venues like the city theatre 'Stadsschouwburg' and a casino. There is also a tram stop around the corner, which enables you to reach all the sights even quicker, although Amsterdam is easy to explore on foot. Cancellation policy: 72 hours before the date of arrival. Where cancellation is made outside of the above terms the guest will be charged the full amount of your stay. In case of no show the total amount is charged. Pre-authorization - 6 days prior to arrival, 100% full amount of the entire stay.